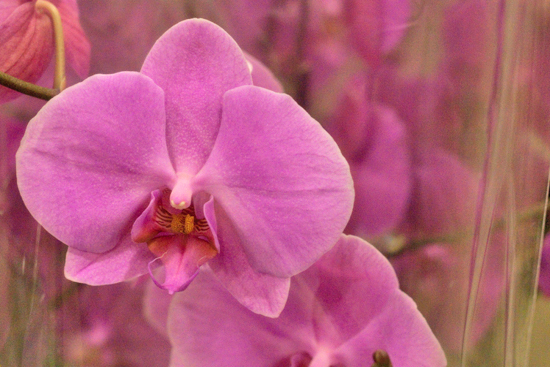 Mention orchids and the first variety that might come to mind is Phalaenopsis. As well as this type though, there are many others available at New Covent Garden Flower Market, both as a cut flower and as a plant. 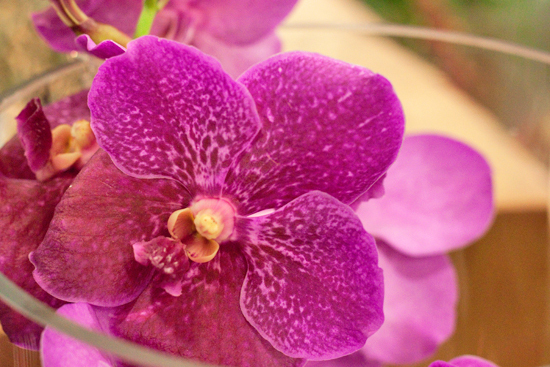 In this month's report, we're going to take an in-depth look at this exotic bloom, starting off with these stunning Purple Passion Phalaenopsis at Dennis Edwards. We'll cover Phalaenopsis, Vanda, Cymbidium, Dendrobium, Paphiopedilum, Cambria and Oncidium…all members of the Orchidaceae family. 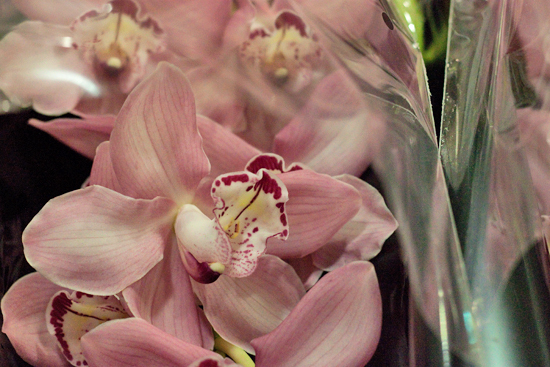 The majority of orchids on sale at the Market come from Holland and they're available all year round. However, Cymbidiums are more seasonal. Cut flower-wise, from June-August, they're sourced from further afield, from countries including Australia, New Zealand and South Africa. Plant-wise, their availability is from Sep/Oct through to April/May. 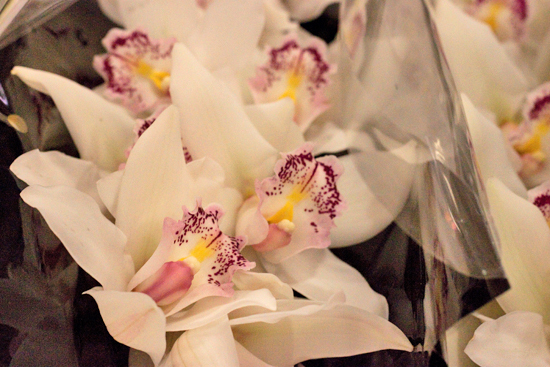 Both as a cut flower and plant, orchid blooms are generally long-lasting. 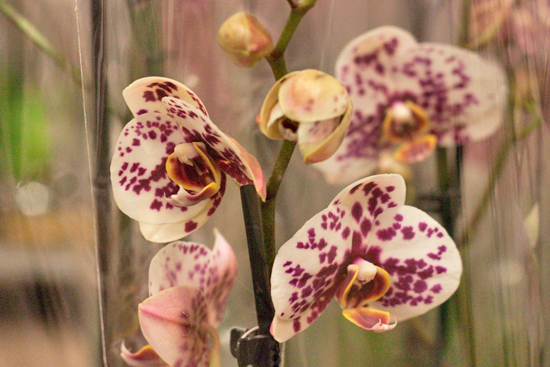 For example, Phalaenopsis as a cut flower has a vase life of 2-3 weeks. As a plant, it's very much dependent on their environment and how they're looked after. But they're usually in flower for several weeks. Within each species, there's a wide range of different colours. E.g. 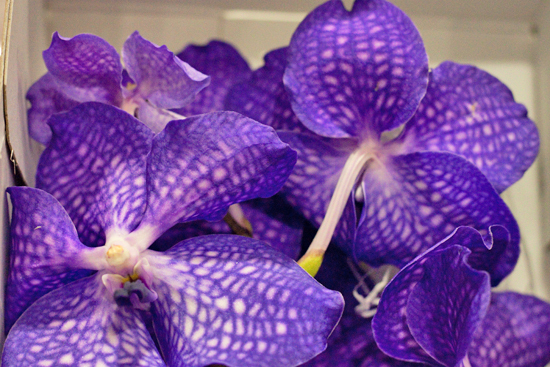 Vandas are available in violet blue, purple, pink, burgundy, yellow, white and orange. 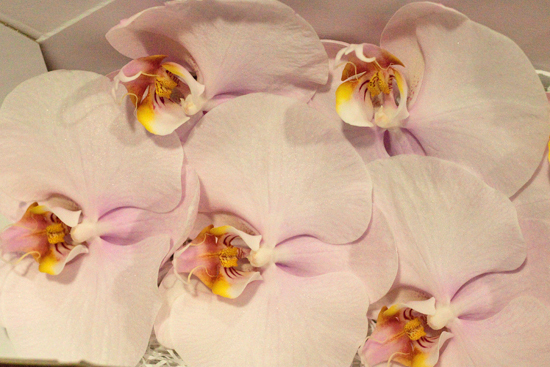 Also, known as Moth Orchids, Phalaenopsis have fleshy, butterfly-shaped blooms. White Sensation, which you'll find at several traders including S.Robert Allen, is a popular variety. Surabbya (sometimes spelt Surabaya) at Alagar. 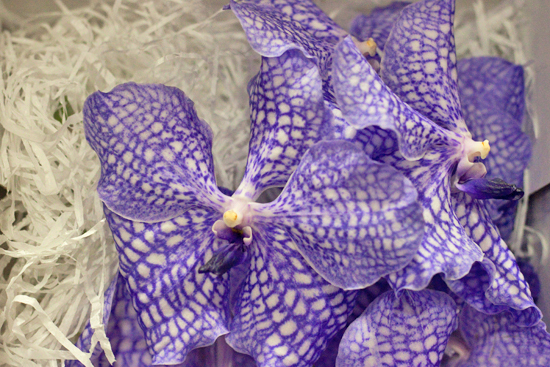 Vanda petals tend to have a crystalline texture, which makes them glisten in the light. 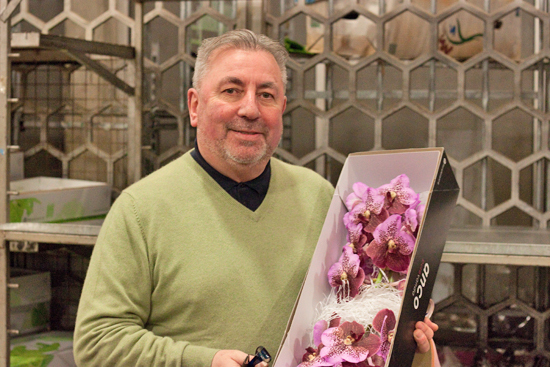 Dennis Edwards says that Vanda Orchids have really risen in popularity over the last 7-8 years and he sells large quantities of them. Blue Magic, with its vibrant violet blooms, is very popular. Pink & Mahogany at Dennis Edwards. 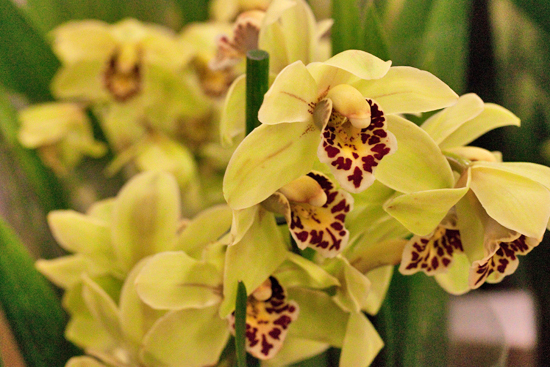 Cymbidium Orchid flowers have fleshy petals and the individual blooms grow along the length of the stem. Other popular varieties include Yogi Bear with gold/brown petals and a green variety called Mint Ice. 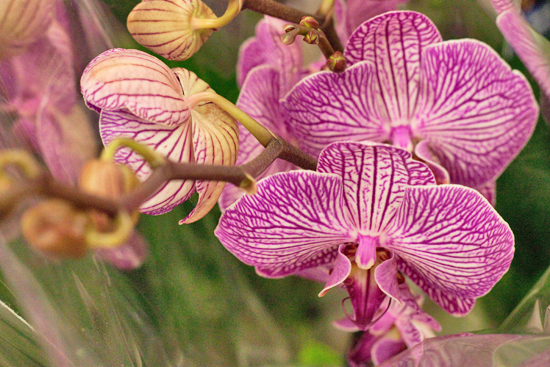 Also known as Singapore Orchids, Dendrobium Orchids have delicate, small blooms. Sometimes, they're sold by colour and sometimes by name. Den Woong Leng at Dennis Edwards. Green Tiger at Dennis Edwards. 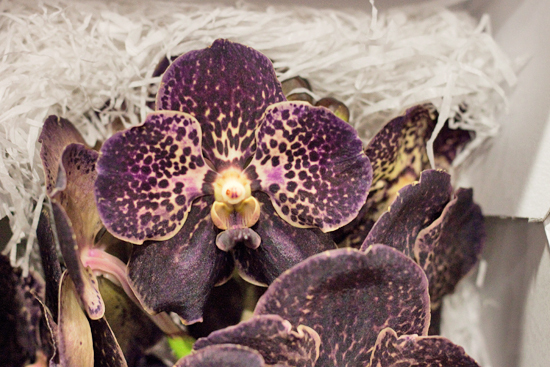 Several plant wholesalers stock orchids at the Market including Quality Plants, Orchid House, Arnott & Mason and Goodchild. 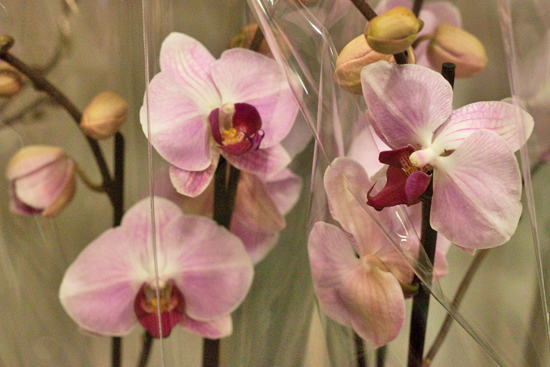 There are lots of different varieties of Phalaenopsis available, in a huge range of colours and petal type. But the most popular colour is white, followed by pink. Sought-after too are the multi-flora varieties, which are smaller plants with a pot diameter of 12cm. 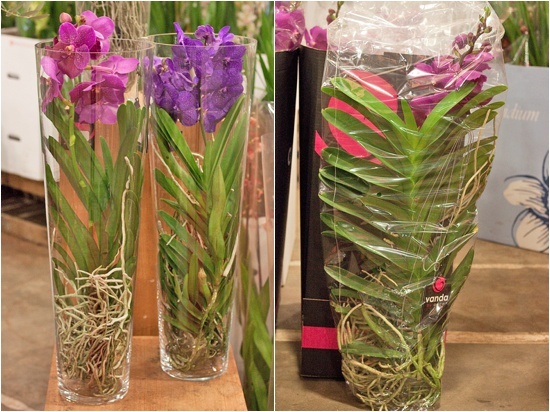 Vanda Orchids come from the growers either in a glass vase or plastic bag, as you can see below. 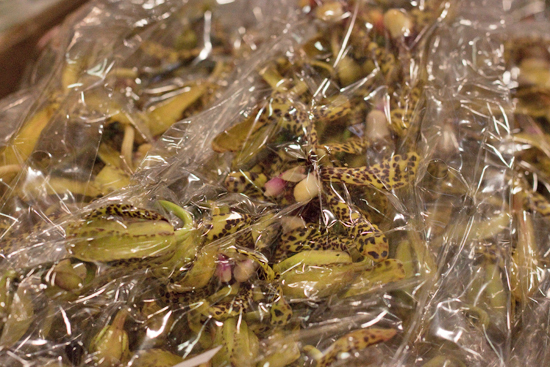 They're air orchids and in the growers' greenhouses, they're hung from wires. 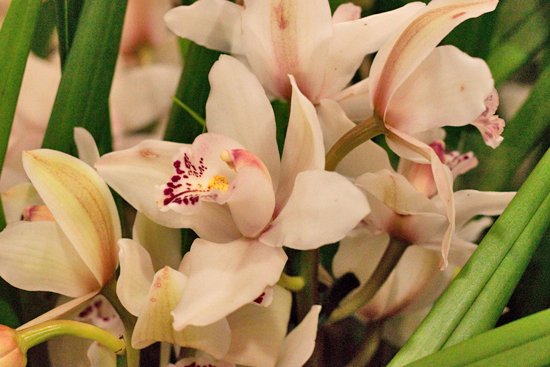 You'll find several different varieties of Cymbidium plants at the Market. 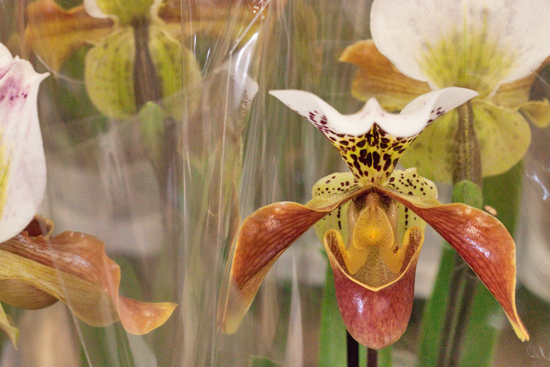 The blooms have a distinctive labellum (lip), which is the most colourful petal. 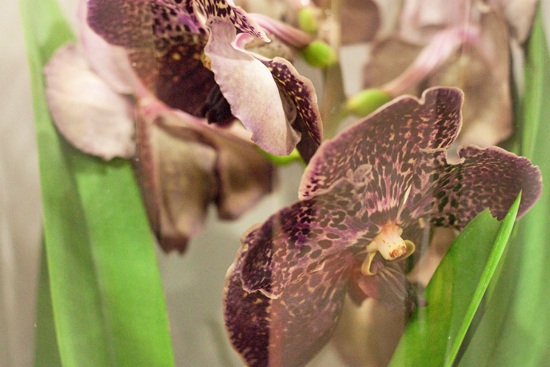 Sometimes known as the Slipper Orchid, Paphiopedilum are also available as a cut flower. 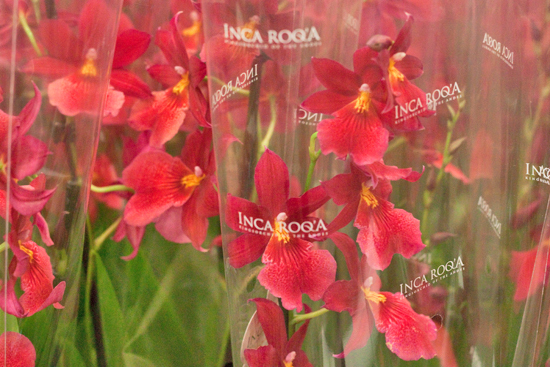 This vibrant variety of Cambria Orchid is called Nelly Isler. Did you know that yellow Oncidiums with large lips are sometimes called 'dancing ladies', because their lips resemble skirts? 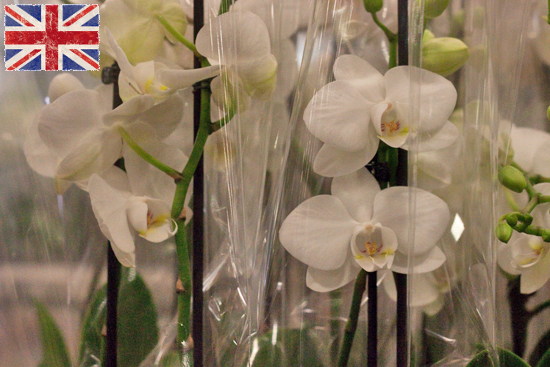 If you're looking for British orchid plants, then head to Quality Plants. 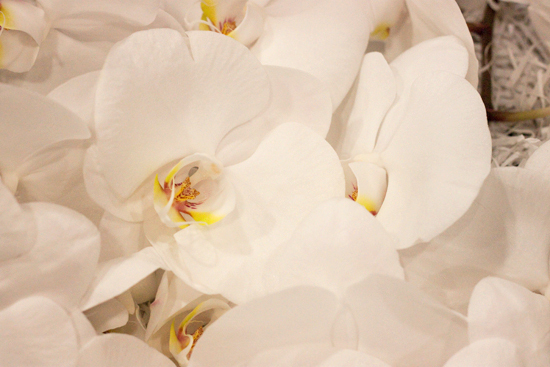 They source white Phalaenopsis from a specialist British grower. Orchid House also sell plants which are grown in their glasshouses in Enfield. 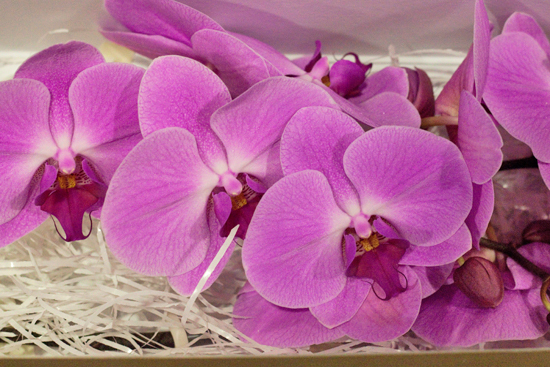 Orchids, as cut flowers, are sold in boxes. 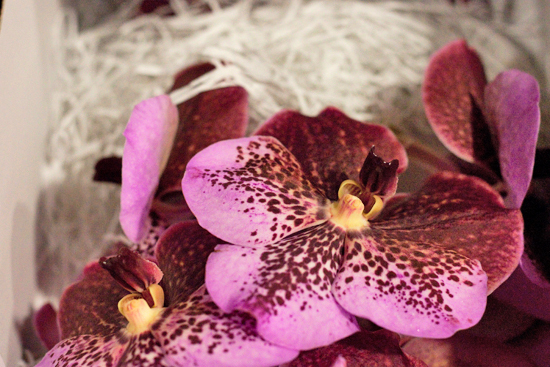 Both Phalaenopsis and Vanda are priced per individual bloom. 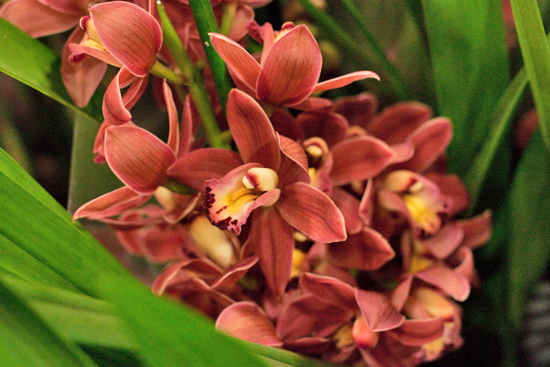 Cymbidiums are sold by the stem, with usually 15 blooms on a stem. 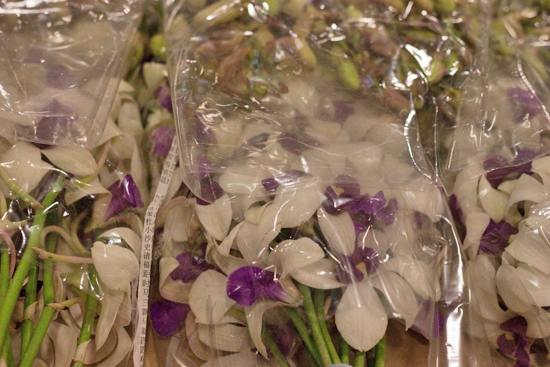 And Dendrobiums come in bunches, with 10 stems per bunch. Prices fluctuate depending on demand and supply. Orchid plants tend to be sold individually, as opposed to by the tray. 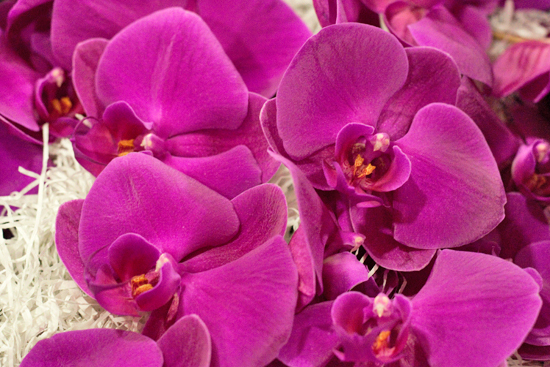 Phalaenopsis are priced by their size, in terms of pot diameter. You'll find sizes such as 6cm, 9cm, 12cm and 15cm up to 90cm/1m. 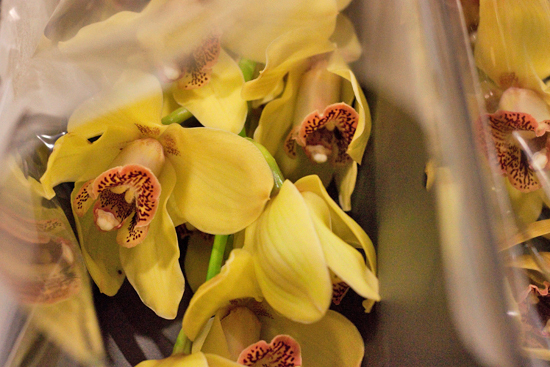 Generally, orchids prefer to be kept at a warm temperature. 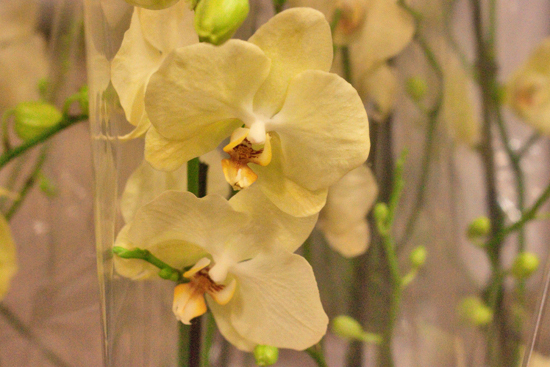 With regards to revival, if you have wilting Phalaenopsis blooms, they can be revitalised by floating them on water at room temperature for 15-30mins. Both they, Vandas and Cymbidiums like to be misted occasionally. Keep them in a bright place out of direct sunlight. They prefer to be kept above 18-20C and their growing medium should be kept moist, but not wet. Water over a sink once or twice a week using tepid rainwater, if possible, and allow to drain. Phalaenopsis can still flower beautifully in a ceramic pot, but when the plant is not flowering, it's better not to cover the clear growing pot, because the roots need light to help the plant grow. 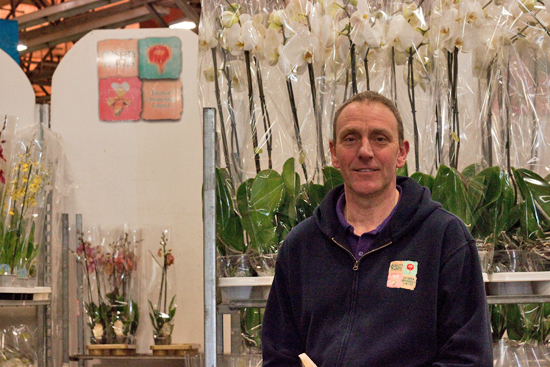 Craig at Quality Plants, who as well as selling a wide range of orchids, also has orchid feed and bark, advises you to either mist Vanda roots or soak them in tepid water for 20-30mins, once or twice a week. They like to be kept at 17-28C. Make sure that they get as much light as possible, but don’t put them in direct sunlight in the summer. 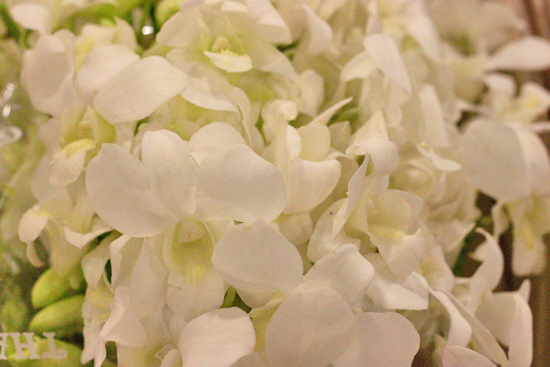 With regards to using orchids as cut flowers in designs, Phalaenopsis with their arching flower stems are ideal for bridal bouquets and tall tablecentres. 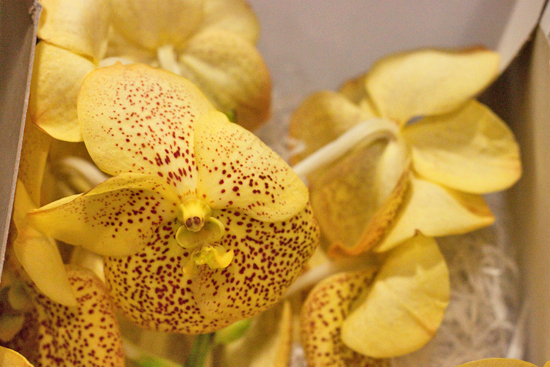 Individual flower heads look stunning simply placed on a napkin to brighten up a place setting and Vanda Orchids can equally be used for this form of decoration. 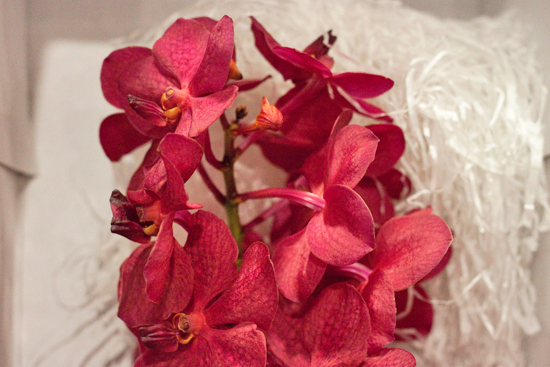 For buttonholes and corsages, Cymbidiums, Phalaenopsis and Vanda are the perfect choice. And for a deconstructed design, their individual flower heads, together with coloured aluminium wire, can be submerged in water in tall glass cylinders for a real statement. Dendrobiums, with their smaller blooms, are great for wiring work, especially floral jewellery. 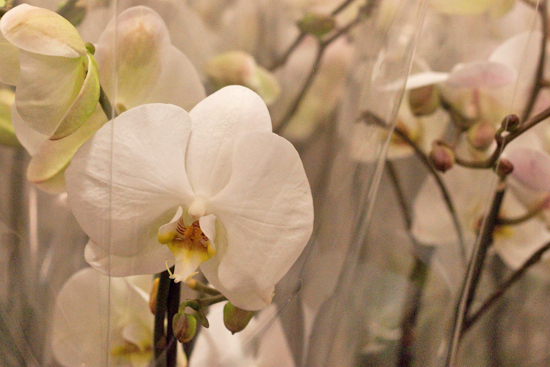 As plants, Phalaenopsis are very popular with offices, hotels and restaurants due to their long-lasting nature. Several plants look wonderful grouped in a container with birch twigs for a natural look or for a contemporary feel, with zingy mitsumata. 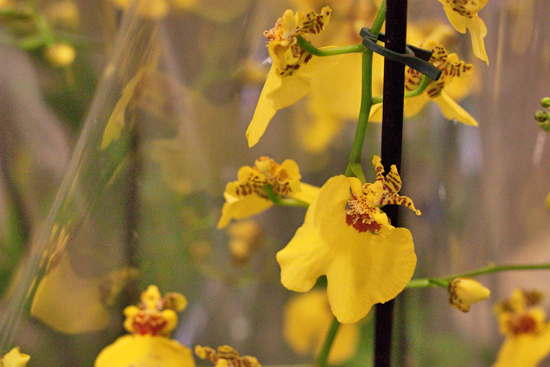 For even more information about orchids, you may like to visit the OrchidsInfo website. P.S. 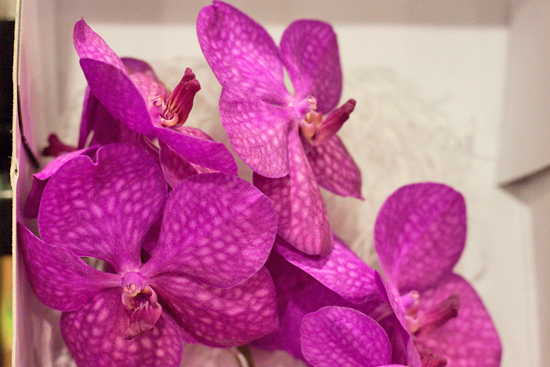 Did you know that the Pantone Colour of the Year 2014 is Radiant Orchid?